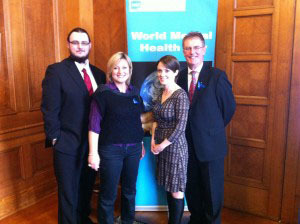 The South Eastern Trust World Mental Health Day Events Committee, of which AMH is a member, held an event “Celebrating Recovery Through Art” at Parliament Buildings, Stormont to mark World Mental Health Day. Jonathan Curran, a client from AMH New Horizons Downpatrick, was invited to speak about his experience of the arts and the impact this had on his mental health. Through New Horizons, Jonathan has been involved in two film projects and is currently doing a drama course. Albert Schweitzer once said, “In everyone’s life, at sometime, our inner fire goes out. It is then burst into flame by an encounter with another human being. We should all be thankful for those people who rekindle the inner spirit. When I first started with AMH, well for a start you wouldn’t have gotten me up here speaking to a room full of people, but more than that, I was introverted almost to the point of being a hermit and I was a bad tempered wee sod to boot; without their help, I probably wouldn’t be here today. I started in AMH to help get myself back into work, I’m still not quite at that point yet but I’m far closer than I would have been otherwise, mostly thanks to the courses that I have attended. I had attended a media class in Tec before coming to New Horizons but had been unable to finish it because of work, so when the offer of a film course came up I practically jumped at it. The film was a short documentary about how Downpatrick and how it changed between the 50’s & the 80’s, we did it in the style of an oral history, interviewing some of the more well know characters in the town, people who had been there long enough to really know, and be able to tell us how our town had changed and tell us in their opinion if it had changed for the better or worse, I have to admit, I learned a lot working with all these amazing people from my hometown, that I never would have gotten to know otherwise. During the course of making the film those of us on the crew worked hard together to produce the best quality of film we could, it was great for teambuilding, I made friends on that shoot that I’m still in touch with and that I wouldn’t replace for the world. Everybody tried their hand at pretty much every part of production from camera and sound work to directing some shots and even taking the interviews, personally I preferred working with the camera. Following on from this the film premiered in the local cinema, we somehow managed to fill the screen not only on the premier night but on a second night when we were presented with our certificates for completing the course, I’ll be honest I was petrified on both occasions, I didn’t want to even go to either premier but I did and I’m glad for it because everyone who saw the film, on both occasions were complementary of it while I was doing my best to hide they sought out myself and the other crew members to congratulate us on a job well done, it was a huge boost to my confidence, even today whenever I’m feeling low or nervous about something I think back to those nights and smile thinking of the nice things they said. It turned out that much to my surprise, the course was being graded, I got an A. It was the first A that I had received at that level, equivalent to an A at GCSE something I never managed when I was in school, it might not seem like much but to me it was a big deal and something I’m still proud of. I think doing this course sparked, or at least, reminded me of something I enjoyed, because since completing it I’ve been a very different person, I’m more open, friendly, admittedly you still couldn’t call me an extrovert or the life of the party by any stretch of the imagination, but I’m more willing to try and I’m more accepting of change, something I have always struggled with in the past. I’ve since moved onto doing a drama course with AMH and we put on a small production a few months ago, hopefully the results will come back as positive as the film. AMH and the courses it runs are responsible for rekindling my inner flame and I am forever grateful for the work they’ve done to help me. Thank you all for taking the time to listen to me ramble on, it’s been a pleasure speaking to you all today.